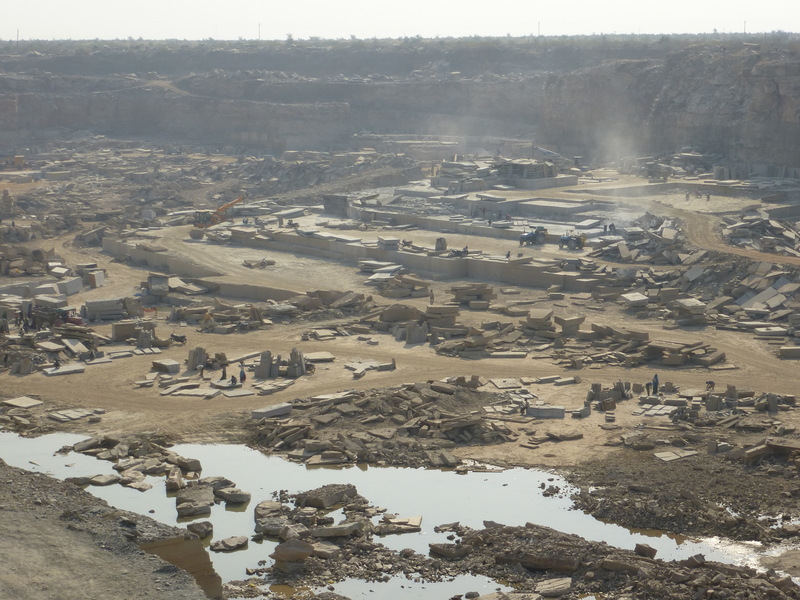 ‘Budhpura ’Ground Zero’ Sandstone quarrying in India’ (2005) was the first report paying attention to the prevalence of child labour in the Indian sandstone industry, particularly in the production of cobbles in Budhpura. Budhpura is a rural area in the heart of the sandstone belt in Bundi district in the south-east of the west-Indian state Rajasthan. The area is a major source of sandstone cobbles, which are mainly sold on the Belgian, northern French, British and Dutch market. The villages Dhabi, Budhpura Village and Parana are the central focus of export production. Many children aged between 6 to 14 years are out of school in these villages and many of them are involved in the production of cobble-stones on a part-time or fulltime basis. In 2013 ICN and Manjari, with support of stone-importer Beltrami and the Dutch Sustainable Trade Initiative (IDH), piloted a Child Labour Free Zone (CLFZ) project in 5 hamlets of Parana. The CLFZ approach, developed by MV Foundation, aims at eradicating all forms of child labour in a certain area, such as a hamlet, village or number of villages. In this approach, all stakeholders are sensitized and mobilized to take responsibility to ensure the right to education of all children in their area. The strength of the community is central: all relevant stakeholders including parents, children, teachers, local authorities and companies work together to get children out of work and into school. Eventually, the CLFZ approach aims at changing the social norm that accepts child labour into the norm that no child should work and all children should enjoy full-time education. cobble yard owners and contractors in supply chains of Beltrami were pro-actively promoting not to employ children and monitoring the occurrence of child labour in their supply chain. 361 children were prevented from child labour and 593 were withdrawn from child labour, on 1019 children in total initially identified as ‘out of school’. 7 schools (6 primary, 1 secondary) were running fully functional compared with only 1 before; 8 pre-school centres (Anganwadis) existed where none was operational first. 84 girls and 22 boys (15 to 18 years) completed respectively stitching and 6-months electrician training, allowing them to be more self-sufficient without having to rely on the cobble trade. 17 women self-help groups were established, consisting of 197 members. 570 people received access to pensions or benefits for widows that they were not aware of before. 586 workers received a health and accident insurance, paid for by their employers. 69 cobble yard owners and traders have taken the issue of banning child labour seriously since the Cobble Traders Union sanctions violation of this ban. 14 yards have installed camera surveillance. Working at the grassroot level and being able to connect with the poorest people. Door-to-door motivation visits, to make children and parents aware of the importance of education. Providing alternative sources of income for families, so it is no longer necessary for children to contribute to family income. The evaluation indicates challenges as well, such as the difficulty to re-enrol children aged 10 to 14, as they have established a certain spending pattern and the lack of motivation among teachers. Furthermore, the continuous flow of migrant groups and limited social interaction between migrants and residents makes it difficult to mobilize the community, establish local structures and raise awareness. To overcome education challenges Manjari organizes different activities: volunteers motivate children to go to school and accompany them from their home to school and back; Manjari supports the government school teachers and ensures Dalit children are not discriminated at school; School Management Committees are set up as well as a teachers forum where teachers discuss school improvement potential; and Manjari lobbies continuously with government for more teachers and better school infrastructure. Besides getting children out of work and into schools, Manjari works together with the district and state government to screen sandstone workers on silicosis and other occupational diseases and to organize health check-up camps for their families. The Family Entitlement Facilitation Center in Budhpura Village, set up in 2015, serves as a one window solution for families to access legal rights and other government schemes like widow pensions and accident insurance. In the center, Manjari also organizes after school activities for children and engages with all stakeholders to ensure their support for the project activities. Since 2015, the UK-based company London Stone joined Beltrami to use their supply chain leverage to urge cobble suppliers and traders to reject child labour in their yards and monitor that children are not involved in home production of cobbles. By doing so, they support Manjari top-down in creating and sustaining the Child Labour Free Zones. The effectiveness of the CLFZ approach has proven itself over the past years. In order to address the challenges posed in the evaluation, the project has now entered a new phase. In this phase the focus lies on upscaling and strengthening the child labour free zones and sustaining them for the future. The goal for the coming years is to declare the area child labour free and fully hand over responsibilities to the local community. As local and international businesses active in the area are part of the community, they are, together with CSR initiatives, explicitly involved in this project phase to strengthen their contribution and active participation. There is lots to do. Underlying causes of child labour remain challenging in getting all children out of work and into school in Budhpura. Think for instance of: high migration rates, poor working conditions, high prevalence of occupational diseases (e.g. 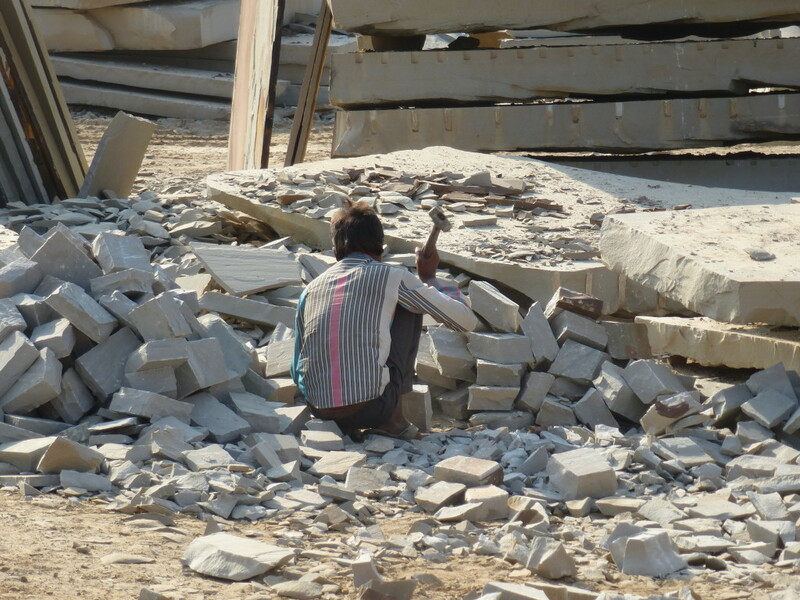 silicosis) causing people to become only 40 to 50 years on average, addiction, caste discrimination and poor access and quality of public services. Also, the cobble production area has expanded to neighbouring villages. For that reason, Dhorena is added to the project area. There are two very new aspects to the coming period: with the new partner organization TFT a pilot project will be established with 5 cobble yards where workers’ rights are respected, beyond child labour. TFT provides support for this pilot, by working with yard owners and workers to agree realistic and appropriate standards for cobble yards and encouraging others to gradually adopt those as well. By understanding salient workers’ rights violations and providing and demonstrating solutions, the project aims to increase participation of business representatives in the community development process. Manjari will develop guidelines applicable for cobble yards in collaboration with TFT and relevant stakeholders. The guidelines will feed into the self-monitoring system, which will be established in this project period, and will therefore play a vital role in strengthening and sustaining the CLFZ in Budhpura.